I have issue 232 of the mighty world of marvel. 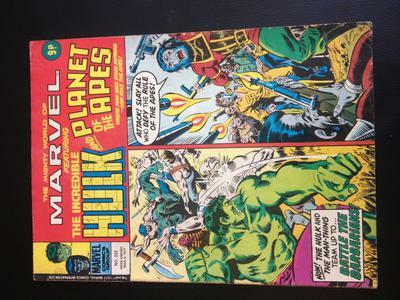 It features the incredible hulk and the planet of the apes! It's dated march 9 1977 it has some slight wear and also so slight wear on the seam the pages have some sun damage but is in really good condition over then that. none of the pages are torn or ripped. in this issue the the hulk and the man-thing team up! Editor's reply: You have a comic book only published in the UK. Mighty World of Marvel is unfortunately not very valuable. There are some hopeful items listed on eBay UK; I doubt whether many, or any, will actually sell. MWOM was quite popular. However, that popularity does not extend across the pond. America drives the market for back issues. 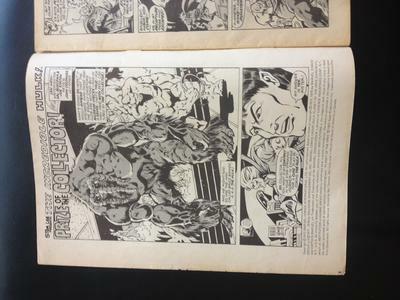 Reprints in black and white of color original stories are not very much sought-after these days. Your issue is probably worth about a Quid. Sorry! Read more about the Mighty World of Marvel at Wikipedia. See more Marvel comic superheroes and their values.